It takes years to create military and naval equipment and to train men and women for service in the UK Armed Forces, yet those hard won, carefully nurtured capabilities and people can be easily thrown away. With the ill conceived 2010 Strategic Defence and Security Review (SDSR) that is exactly what the coalition government led by David Cameron did. Within months it needed strike carrier power to handle the Libya campaign but it had axed HMS Ark Royal and her Harriers and had to fall back on expensive land-based air. In addition, the UK’s lack of a Maritime Patrol Aircraft (MPA) – another capability cut in 2010 – has proved deeply humiliating. See below. Now, five years later, the same Prime Minister is filling in some of the gaps he tore in maritime forces, admitting that perhaps errors were made. Prior to the results of SDSR 2015 being revealed there were serious fears that only eight Global Combat Ships (Type 26 frigates) might be ordered in total. That would have signalled a reduction in the surface combatant force to unacceptable levels. However, the Prime Minister pulled a commitment to new ‘light flexible frigates’ out of his back pocket. These warships have been under consideration for some time – the long mooted Black Swan Class – but there was no previous indication of a government desire to actually build them. The ‘light flexible frigates’ are, anyway, still only an ambition rather than an actual order, with a concept study to complete before anything else can happen. A graphic showing the possible shape of the UK’s future ‘flexible light frigate’ (or Black Swan Class) highlighted in SDSR 2015. Image: UK MoD. Scrutinising the fine detail of the defence review indicates eight Type 26s promised are only the first batch, with a further five to come at some date. 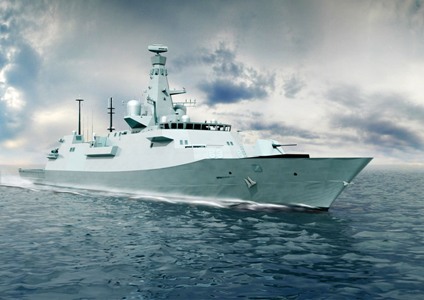 The UK MoD has committed itself to a force of 19 frigates and destroyers, with the proposed light frigates in addition to this, potentially making in total a force of 24/25 frigates and destroyers by the 2030s. Britain’s actual defence needs require around 30 frigates and destroyers. Another significant development for the Royal Navy is the Prime Minister’s commitment to four Trident Successor submarines. Reducing the nuclear deterrent force to three vessels was proposed when the Lib Dems shared power with the Tories. There were fears just three ballistic missiles submarines (SSBNs) would lead to holes in deterrent cover. The construction of the Trident Successor submarines has yet to be 100 per cent confirmed by government (though the green light seems likely in 2016). There is a feeling abroad in the UK that there first of all needs to be a full and proper national debate on the future of the deterrent. 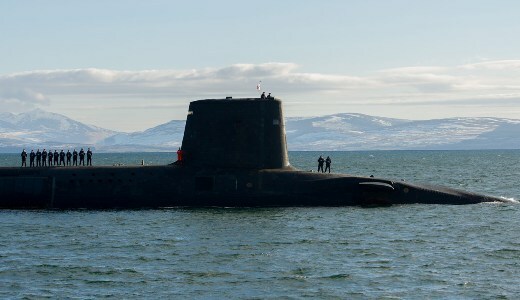 The current generation Trident missile submarine HMS Victorious completing her 100th deterrent patrol. Photo: UK MoD. When it comes to the Royal Marines, the defence review promises a future for them as the UK’s amphibious and Arctic warfare specialists. One of the two new aircraft carriers is to be enhanced especially to carry them into action, though it seems the dedicated helicopter carrier HMS Ocean will not be replaced with a similar vessel. In terms of fleet support three additional logistics ships are to be constructed. Also as part of SDSR 2015 the Prime Minister announced a further two Offshore Patrol Vessels (OPV) will be built to fill gaps, bringing the total of patrol ships currently on order to five. A new national shipbuilding strategy has been promised for 2016. The decision to invest in nine US-origin P-8 Poseidon Maritime Patrol Aircraft (MPA) to be operated by the RAF came as – for the third time in a year – Britain suffered the humiliation of ‘borrowing’ MPAs from allies (France and Canada) to search for a suspected Russian attack submarine intruding into UK home waters. Beyond all the fine words about new equipment there remains serious concern about personnel levels. The RN is not getting all the extra manpower it needs to crew the new aircraft carriers and it allegedly wanted a 2,000-strong boost to recruitment. It’s only receiving an extra 700. This means it will continue to siphon men and women away from other warships, and even Royal Marines, to ensure carriers can put to sea. Amphibious warfare ships may well be mothballed to crew the new carriers, an unwelcome move when the two Landing Platform Docks (LPDs) HMS Albion and HMS Bulwark are arguably both badly needed on operations. • This is a compressed version of an article to be published in the January 2016 edition of WARSHIPS IFR. To read the full text – buy the magazine! The forthcoming Type 26 Global Combat Ship (or frigate). SDSR 2015 commits the UK to ordering eight in the first batch. Image: BAE Systems/UK MoD. 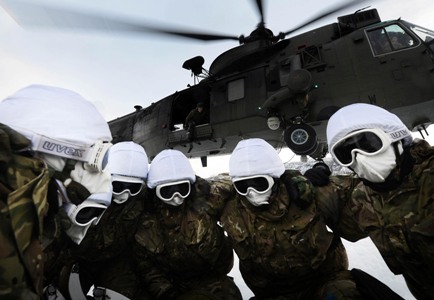 Royal Marines under training in Arctic Norway, on NATO’s northern flank where the elite troops help guard against potential Russian aggression.